This Valentine, plan for some exciting surprises for your loved one. 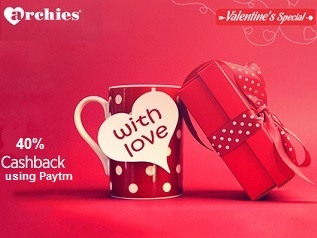 Paytm is offering 40% cashback on Archies 's special valentine gifts. To show your true love, shop for amazing gifts like Teddies, Chocolates, Photo Frame, Mugs, Show piece and many more gifts for your love symbol available online. Just pick and click to place order to your doordstep offered with 40% cashback if you pay through your Paytm wallet. Cherish your wonderful moments with beatiful gifts that will leave a melodious memories behind. Logon to Archies online gallery and avail your cashback now only with Paytm!! Click here to get offer page. Register / Login to Archies. You will get 40% cashback in your wallet. Cashback is valid for Paytm users only. Leave a lovemark with romatic archies gift surprises offered with saving deal available only at Paytm!! !